Have I died and gone to roast duck heaven?? I think I must have. 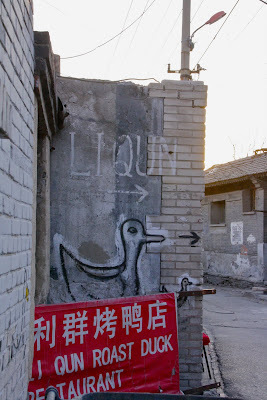 Tucked into an old hutong alley in Beijing is a true gem - Li Qun Roast Duck Restaurant. Yes, it's in various guide books so it's no longer a secret, but that doesn't make it any less good. This is truly fabulous food. And exactly what makes this truly fabulous food? Firstly, the location - just follow the ducks painted on the walls to get to this old house down a small lane. The restaurant entrance is a red door leading down a dark hallway. At the end of this you can see the flames from the duck roasting oven straight ahead, with five fat ducks hanging inside. I can already tell that this is going to be a memorable meal. 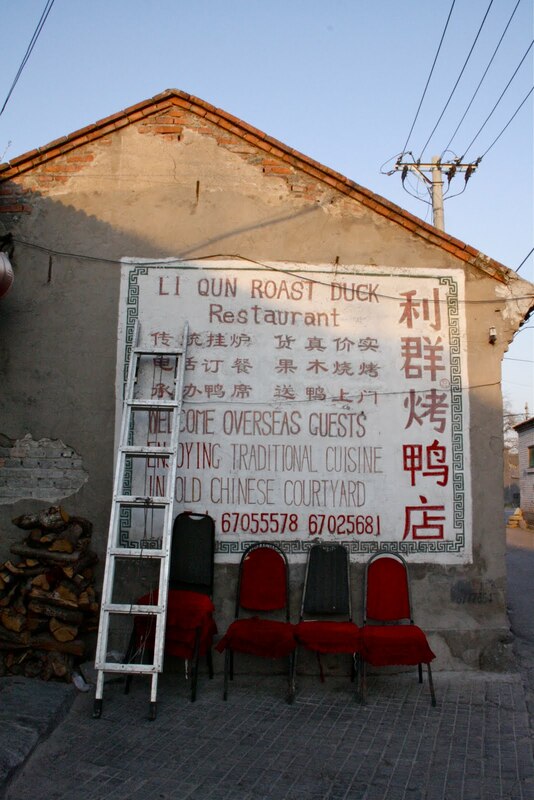 Walk past the fireplace into the covered courtyard, where the elderly owner is having a bowl of duck soup before the busy night ahead, and chatting with the waitresses. Doorways lead off the courtyard to various 'dining rooms' which were presumably once living areas and bedrooms. The walls are painted a cheery imperial yellow and there is geometric patterned lino on the floors. If you imagine your grandmother decided to convert her old weatherboard cottage in Spring Hill to a char-grilled steak joint, you'll get the picture. It's very home style. Secondly, the food. 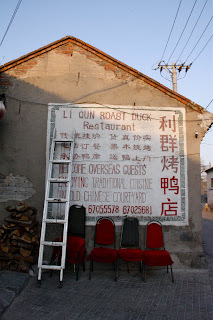 At Li Qun they make just one type of dish here, and they do it really well. 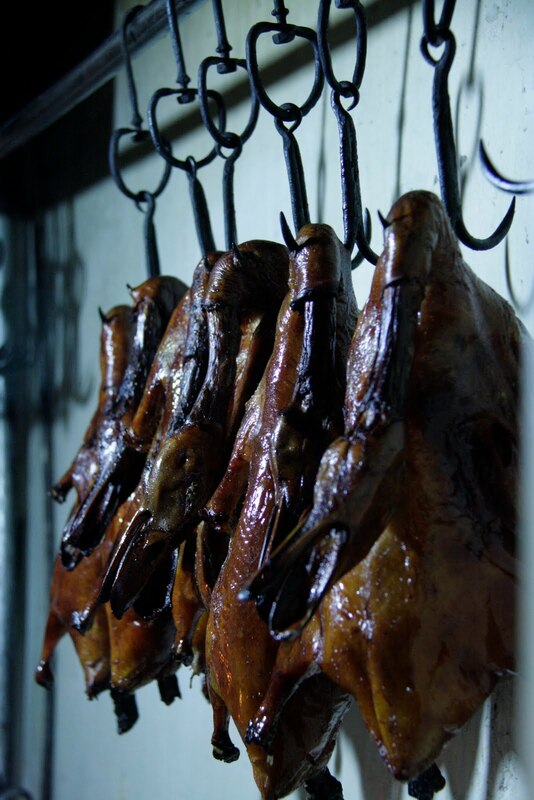 These Beijing ducks are plump, with a fine crispy skin. The oven fire is fuelled by fruit tree wood, rather than gas, so the ducks have a delectable smoky edge to the crisp skin and succulent meat. The accompanying pancakes are thinner than wafer and a little larger than others I've eaten, which means they can hold a bit more duck and hoisin sauce. We chose several side dishes like cucumber smashed with garlic, and deep-fried peanuts with vinegar, to cut through the richness of the duck meat. Thirdly, there's the ambience. Here, it's contagiously fun and every single person is enjoying themselves immensely. It's a low-brow, home-style experience. Don't dress up, don't expect an indoor bathroom, but do come with a big appetite. As your chosen duck is being carved at your table into clever slices, each with the necessary crisp sliver of duck skin, you can appreciate the theatre of it all. And the cost? About $15 a head, including tsing tao beer.